March 5-18, 2014, a small Alaska team of Kayla Rowe and Elle and Bob Arnold traveled from Anchorage to Chiang Mai meeting up with an annual Free Burma Rangers Team Meeting after worshiping and joining the Day of Prayer for Burma at Chiang Mai Christian Church. Alaskan Jeff Wheaton had just joined the FBR communications department. The team grew with Singapore physicians Tchoyoson and Angela Lim and translator- Dhee. The initial part of the trip joined Allan Eubank in Umphang with Karen cataract medic NayHser to discuss border health with hospital director Dr. Warawit. 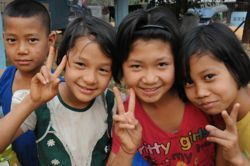 The girls and Dhee took taxi ahead to hold first day eye clinic on Wednesday. 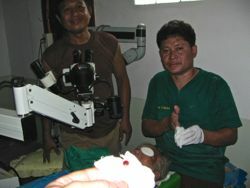 The remainder of the team and NayHser arrived later Wednesday, but were able to complete 24 cataracts and other cases in the two remaining days. Friday night was a 61 minute dusty drive to LehTongKu in order to assist initial survey and 50 post holes for Eliya's new clinic. We held colorful painting of Mark 1:9-11 childrens church before worship service and great food Sunday. Monday was all-day drive back highlighted by a meeting with Dr Cynthia Maung and Frank Green in MaeSot. A quick, hot mountain run with FBR leaders Tuesday morning for a long March 18th all the way back toward Alaska through Seattle.